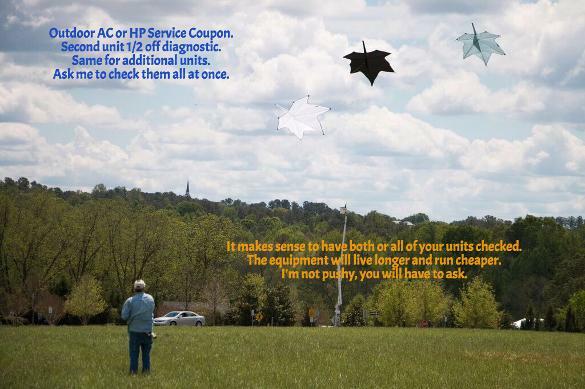 Rainbow Services - HVAC coupons! These coupons can appear and disappear according to work load, without notice. If you want one, call 919-630-1776 and make an appointment. You'll lock in your savings! Heating and air conditioning service coupons are valid in Raleigh only. 3. 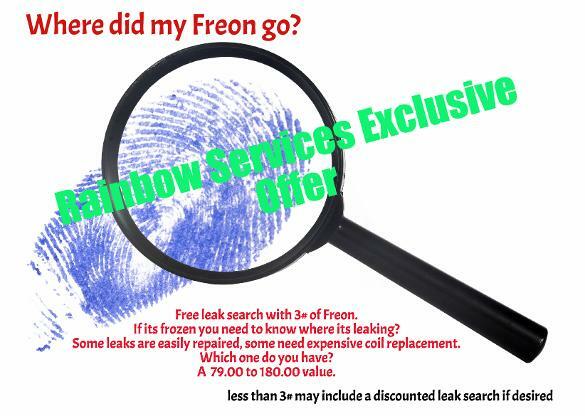 More than 3# of Freon-22 or 5# of R-410a, free regular electronic leak search. Central Raleigh 27601, East Raleigh 27604, Falls of Neuse 27609, Five points 27608 and 27605, Glenwood 27609, 27608, 27612, 27607, Hillsborough 27605, 27607, 27608 Mordecai 27604, North Raleigh 27609, 27613, 27614, 27615, North Central Raleigh 27601, 27610, Northeast Raleigh 27604, 27616, Northwest Raleigh 27613, 27617, Six Forks 27609, 27612 South Raleigh 27610, South Central Raleigh 27610 Southeast Raleigh 27610, Southwest Raleigh 27606, Wade 27607, 27608 West Raleigh 27606, 27607. In 27603 we service the northern part a few miles past the 401 70 split, or a bit past the Walmart is our service area border. Any service coupon or quoted service is confined to these areas.